Maybe is was Saturday’s close loss and a long and late drive home from Great Bend. Maybe is was a lack of confidence against Garden City who has won nine of the last 10 against LHS. Or maybe it was just an off night. Tuesday night on Senior Night, Garden City’s girls beat Liberal 57-31 in the Big House. 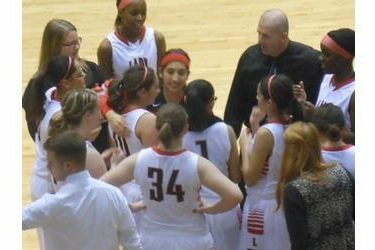 Liberal looked lethargic as Garden led 29-11 at halftime and forced 24 LHS turnovers. It was 41-16 after three quarters. Jada Mickens scored 11 in the loss. It marked Senior Night for Jai Chapman, Stephanie Sanchez, Kambrie Long, and Alicia Collins. Collins sat out the season with a knee injury and although she wasn’t cleared to compete yet, she was on the court for the first several seconds of the game before Liberal called timeout to let Collins step on that court in game action one last time. LHS is 7-12 but still holds onto the #4 spot in sub state as Maize South falls to 6-13 with a 59-37 loss to Goddard Eisenhower. LHS is 2-5 in the WAC and Garden City is 12-8 and finishes 5-3 in the WAC. Liberal plays at Dodge City Friday night at 6 on 1270 and kscbnews.net.